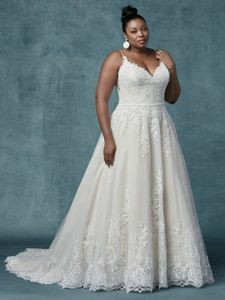 Description: Swirls of embroidered lace motifs waltz from bodice to hemline in this chic A-line wedding dress, accenting the sweetheart neckline, spaghetti straps, and illusion scoop back. This style includes an attached beaded belt. Finished with covered buttons over zipper and inner elastic closure.